The mint adds a lively touch to this salad, which takes about 5 minutes to prepare and may be served as a first course. Use a mixture of winter greens: lamb’s lettuce and arugula are great on their own, or you can add curly endive, Belgian endive, radicchio, red chard, baby spinach or whatever’s available in your region in the winter months. And by the way, an everyday French chef thinks it’s fine to use the prewashed salads that are available in many supermarkets today — as long as they’re superfresh. Wash the salad greens, spin dry and place in a large bowl. Wash, quarter and core the pear. Slice the quarters crosswise and add them to the bowl. 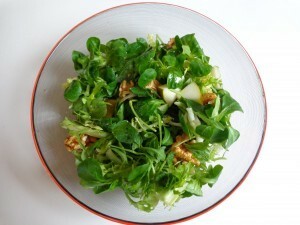 Scatter the walnut halves over the salad. Wash the mint leaves, dry thoroughly, cut crosswise into ribbons and add to the bowl. If not serving immediately, place in the fridge to cool. When ready to serve, add the lemon juice, olive oil and seasonings. Toss well. Serves 2.